None other than the man who invented X-ray Specs, Crazy Crabs, Invisible Goldfish, and Hair-Raising Monsters — all iconic 20th Century novelties. Born in 1926 and raised in New York City, Harold von Braunhut began his career as a budding magician and inventor while still in high school and worked on the first GPS system — the Directomat — for the NYC subway system in the 1950s. A taste for adventure and the bounds of human experience, he also raced motorcycles as the Green Hornet and managed the careers of a man who jumped 40 feet from the Flatiron Building into a shallow kiddie-pool (Henri LeMothe) and one of the most famous mind readers of the 20th century (The Amazing Dunninger). 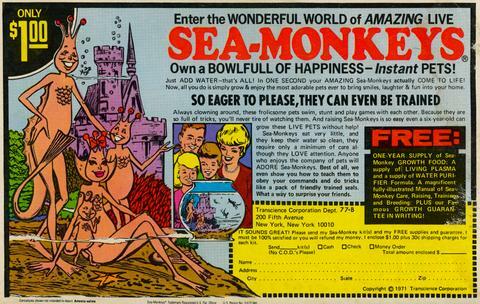 enlisted DC Comics artist Joe Orlando to create the iconic image of the Sea Monkey® family with their crown-like heads and family castle in the back of their Sea Monkeys aquarium. Sadly, the Sea Monkeys lost their father when Harold passed away in 2003. But his widow Yolanda Signorelli von Braunhut, who has been by Harold’s side at Transcience Corp. since the late 1960’s, took over the company and has kept the Sea Monkeys® universe alive ever since. The Sea Monkeys have faced many battles over the years, including attempts to lure them away from the one person who knows and loves them as her own children — Yolanda Signorelli von Braunhut.